Problems must be dealt with first here, and yes, The Dark Knight does have problems, two large ones in fact. The first is Maggie Gyllenhaal, sterling actor though she may be. Who'd have thought that Katie Holmes would become so integral to this franchise? At the time, nothing was thought of swapping out Holmes - for reasons unknown - and drafting in Gyllenhaal to play Rachel but now it looks like an error. Watching Batman Begins and this back-to-back highlights just how key Rachel's moral guidance is for the whole thing to work. The effect of seeing what happens to Rachel, and subsequently what happens to Rachel and Bruce (Christian Bale) is lessened by the change in actor. Katie Holmes was perfectly fine in the first film and her continued presence in the second would have brought a consistency to her character's plot, which would in turn inevitably had more feeling and emotion if she was present. It's a mistake and a weakness and arguably The Dark Knight's biggest. Second to this is a lazy bit of scripting towards the end which turns Batman into some sort of technology-reliant Google-boy. The only way the plot can be solved is through the creation of a mega-MacGuffin-like machine which spits out key information like a character on exposition overdrive. It's poor plotting and it feels out of kilter with the Earthy realism of the rest of the franchise. 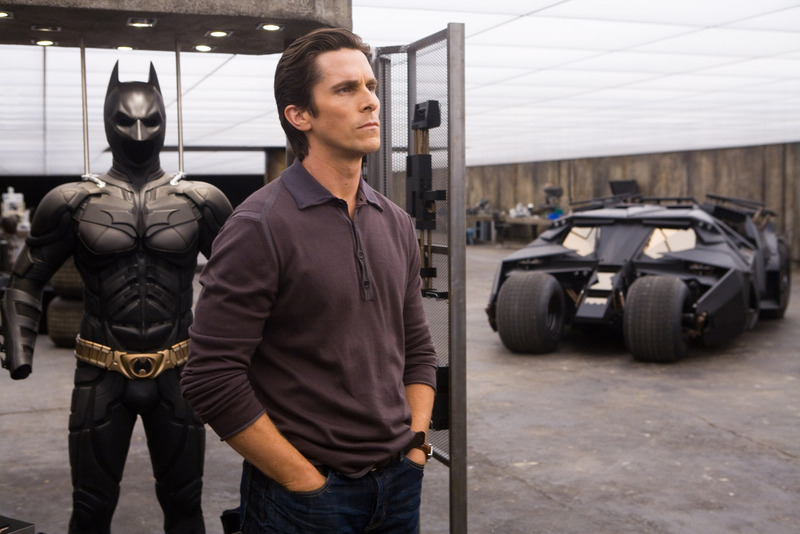 Those problems aside though, The Dark Knight, like Begins, is the perfect superhero film. That Nolan took a franchise in the doldrums and revitalised it once is amazing. That he followed up with a sequel on equal footing to the first film is miraculous. Where Begins was too busy being concerned with Batman's origins to include much subtext, The Dark Knight has more scope to branch out. Democracy seems to be Nolan's touchstone. The introduction of Harvey Dent (Aaron Eckhart) is the first, most obvious, sign of it but look elsewhere and it shows up on occasions throughout; one boat towards the end has 'a vote', election campaigns are referred to, the reveal of 'the machine' sees Lucius Fox describe it in citizen-led terms; 'unethical', 'this is too much power for one person'. Where Begins spent time crafting the bat, Dark Knight tries to ensure we care about the people he is trying to protect. Obviously Nolan also hits on something spectacular for his villain. Heath Ledger's Oscar-winning Joker is sumptuously over-played, the perfect rogue element in a world concerned with authenticity. Where Ra's al Ghul had a scheme, Joker has but a plan for chaos. He is the antithesis of the careful scheming of the first film and he completes a lovely arc back to the simple early comics where good men were good and bad men were bad. So, although The Dark Knight's problems are more obviously apparent than those in Batman Begins, the rest of the film's content is so good they prove easy to forget and almost marginalise. The continuation of Holmes throughout would certainly strengthen the franchise and the 'machine' is lazy but Joker is a cackling genius of a villain, the set pieces literally soar and the intensity carried onwards and upwards from the first film is magnificent. Another stunning super human effort. The Dark Knight is out on BD Triple Play now. I will go on record as saying I thought Katie Holmes was the weak acting link in the first one, but you're right. Without that carryover, we have no emotional investment in the character in the 2nd one. She's this new person who we feel like has no origin. Man, I never thought of that all. Really good point. Of course, if Nolan had just cast Rachel McAdams in the first one, she would have nailed it and been in the second one and problem solved. Yeah, I don't actually mind her at all but accept that plenty of others do. I just think once you've made your bed on that sort of thing - especially when the character is so emotionally important - then you kind of just have to sleep in it, regardless of acting weaknesses. And yes, agree. Rachel McAdams would have been perfect in that role. i dont think shes the best acter but she was ok in the others... many, many bad reviews of her though which just gets into other peoples heads which just gives them a bad impression of her. anyway we'll see of the replacement was a good idea when more people see the film and review the cast. i alos saw a very interesting review on www.kingsfilm.com but this one seems more thoughtful and descriptive. great post!